It’s good when the value of your home increases, right? Yes, generally, most homeowners, look at their homes as an investment in addition to shelter for their families so they are generally happy to see the value of their investment increase. The flip side of it is, homebuyers, particularly first-time buyers, would, of course, like to see lower prices and better value in the home they buy. The thing that helps balance out these competing interests is inflation, but more specifically, the rate of income growth. Not to get into an economics lesson here (which I’m not qualified to teach anyway) but if homebuyers incomes increase at about the same rate as home prices (ditto for interest rates) then, more or less, the “affordability” of a home to a buyer remains the same. Problems arise when those things get out of whack, such as in the period from about 2000 through 2007 when home prices were increasing at a much higher rate than incomes were (and interest rates rose too making it even more fun) which eventually led to the housing bubble burst in 2008 and the real estate market crash. 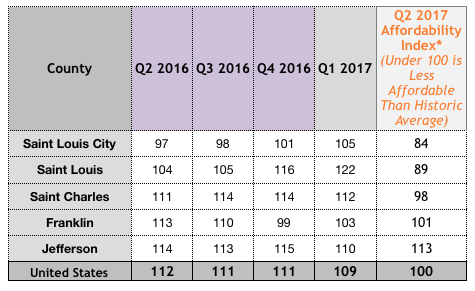 As the table below shows (data from Attom Data Solutions), with just a couple of exceptions, during every quarter for the past 5 quarters, housing affordability in the St Louis core market (city of St Louis and counties of St Louis, St Charles, Jefferson and Franklin) was lower (less affordable) than historic averages (an index number above 100 indicates this, with the higher the number the less affordable housing is relative to historic averages). As the table shows, the city of St Louis had the best affordability index during the most recent quarter in the area, with an 84, the lowest level (most affordable) any of the St Louis core market counties has seen in over a year. At the other end of the spectrum, with the highest affordability index, indicating the least affordable housing, was Jefferson County with an affordability index of 113. Jefferson County also has the dubious distinction of being the only St Louis core market county that saw home affordability decline, or worsen, during the 2nd quarter of 2017 as the others showed improvement. St Louis county, which saw a huge improvement in affordability, came in 2nd and St Charles county third. The table below (Attom Research Data) shows the data behind the affordability index numbers above including home price growth, weekly income growth and then the percentage of wages needed to buy a home in that county. The historic averages are shown as well. Home prices a continually fluctuating, as are interest rates and, to a lessor extent income, so home affordability changes constantly too. The table below, again with data from Attom Data Research, shows we homes were most affordable, as well as least affordable, in the St Louis core market by county. As you can see, and not surprising, all of the counties hit their least affordable period during the 2nd quarter of 2006 with Franklin County being the only exception and hitting it’s peak for lack of affordability in the 4th quarter of 2005. For the most affordable housing period, the city of St Louis peaked early in 2009, with the other counties hitting their most affordable periods during 2012 or 2013.